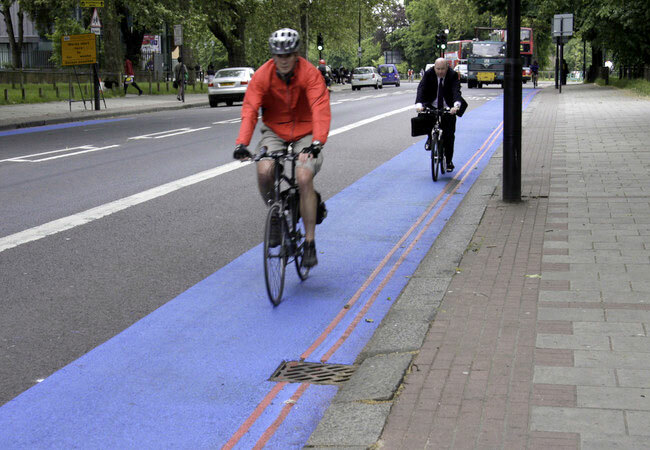 The city of London just announced that bike traffic is up 70% on two major thoroughfares in London proper and they are crediting it all to the opening of two bike superhighways last July. The superhighways were meant to entice people to jump on their bikes instead of in their cars by making safe, direct and simple to follow cycling routes from outer neighborhoods into the heart of the city. The two open superhighways are just the beginning — 10 more will be installed in the coming years — of the city’s big plan to help cut their annoying traffic and unhealthy emissions problems by installing a vast an easy to navigate cycling infrastructure. Watch a video about how Londoners feel about the routes after the jump. The superhighways — as well as London’s bike share program — are sponsored by the UK financial services firm Barclays and are officially titled The Barclays Cycle Superhighways. The Mayor of London’s Transport Advisor, Kulveer Ranger commented on the news, “It is great to see that the first two Barclays Cycle Superhighways are well on the way to achieving our goal to increase cycling in the Capital.” The increase in traffic was officially registered in October 2010 and was measured against the same time period the year before on the same streets. “This research shows that people do believe the routes are of value, make them feel safer and are allowing them to take direct and continuous routes into central London,” Ranger added. By rolling out two of the twelve superhighways first, the city of London was able to take note of what works and what doesn’t. In the 6 months since the lanes opened the city has improved upon their initial plans by installing more safety mirrors, helping with traffic flow in intersections and creating 2,372 new bike parking spaces. With the success of these two pilot routes the city of London has proven that making it safe to cycle in your city makes more people jump on the bike train. The city of London just announced that bike traffic is up 70% on two major thoroughfares in London proper and they are crediting it all to the opening of two bike superhighways last July. The superhighways were meant to entice people to jump on their bikes instead of in their cars by making safe, direct and simple to follow cycling routes from outer neighborhoods into the heart of the city. The two open superhighways are just the beginning -- 10 more will be installed in the coming years -- of the city's big plan to help cut their annoying traffic and unhealthy emissions problems by installing a vast an easy to navigate cycling infrastructure. Watch a video about how Londoners feel about the routes after the jump.